The dentylion (Taraxacum officinale) an pairt o the Asteraceae faimily, is kent as the dandillie or witch gowan an aw. Acause o its diuretic naitur, the dentylion is aft cried pish-the-bed or pee-the-bed. The sap is cried witches' or deil's milk. It is aft said that the dentilion is an antidote for hert-fiver. The dentylion haes yellae flouers. Bairns whiles play whit o clock is it? wi the seed-heids, kent as doun-heid-clocks, by blawin on them. The nummer o seeds that bides on the flouer-heid is syne coontit for tae gie the oor o the day. Dentylions can be makkit intil a wine cried dentylion Wine. 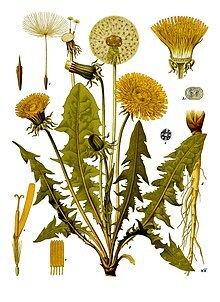 Wikimedia Commons haes media relatit tae Taraxacum sect. Ruderalia. This page wis last eeditit on 3 Apryle 2013, at 03:05.